BRANDON, MB – Paintings by Brandon artists Fay Jelly and Suzanne du Plooy will be on display this summer in the Library at Brandon University (BU). The exhibit will open May 6th in the Tommy McLeod Curve Gallery on the second floor of the John E. Robbins Library at BU, and will continue into late August. Art by Fay Jelly, who lives and paints in Brandon, has been shown in solo and group exhibitions in Manitoba, Saskatchewan, Ontario, Germany, Australia, and Tasmania. A collection of her work, “Visual Adaptations,” was shown at the Art Gallery of Southwestern Manitoba (AGSM) in 2012. She has received awards from the Manitoba Arts Council, and her artistic practice has been fostered by studio programs at the AGSM and by Mentoring Artists for Women’s Art (MAWA) of Winnipeg, as well as a summer program at Red Deer College and at Rural and Arts West Retreats. Suzanne du Plooy also lives in Brandon and paints in her local studio. She attended art classes at BU and workshops at the AGSM, Red Deer College, the Winnipeg Art Gallery, and Arts West Camp at Clear Lake, and private workshops with professional artists in Alberta and Manitoba. 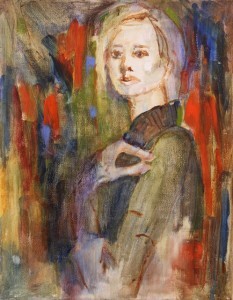 She has exhibited her work in juried shows in Manitoba and currently exhibits with the Group of Eight Artist Salon, a collective of eight women, in venues around Manitoba. 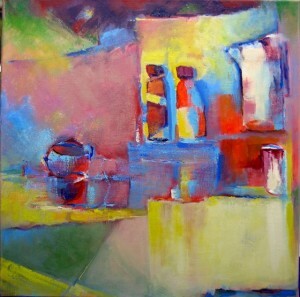 In 2002, du Plooy was a member of a rural artists’ group with mentors Fay Jelly, Barb Flemington, and Shirley Brown. The following year, she was mentored by Shirley Brown through Mentoring Artists for Women’s Art. du Plooy says her work is inspired by the words of poet Mary Oliver, “Instructions for living a life. Pay attention. Be astonished. Tell about it.” Her paintings are based on photographs of the people and landscape taken during her travels that often offer momentary glimpses. It is this fleeting quality that she tries to convey in her paintings through her use of colour, brushstrokes, and the gestural quality of her drawing. This exhibit is open to the public. For John E. Robbins Library daily summer hours, please visit www.brandonu.ca/library.